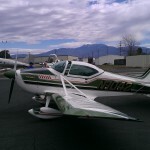 Hemet: a small airport gets better! I hate to say it, but usually when see a small airport has changed, it’s a change for the worse: an FBO has vanished, a cafe has closed (again), or the whole airport is gone. When the opposite occurs I’m practically beside myself with glee. 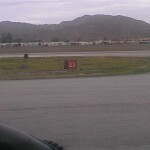 Today I got to see a small airport that looks like it’s in the middle of coming to life: Hemet-Ryan (HMT) in Hemet, CA. 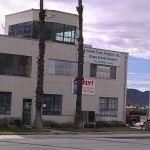 I’ve been to Hemet-Ryan before and have some great memories of the place. I shared the pattern there with someone who had built himself a Mad Max-style Gyrocopter (not the one in the film, to my knowledge) on my private pilot long cross country. I’ve been in and out of there to do a few landings a few times, but hadn’t gotten out of the plane there in years. I saw that there was a cafe there, so I figured I’d stop by. My expectations were pretty low. The last time I’d been there, the cafe hadn’t been much to speak of, pretty much the baloney sandwich type. I was very pleasantly surprised. The pattern had several planes in it as I arrived, which is always a good sign. I joined in behind another Cherokee and pulled in to a large transient parking area. In fact the whole terminal area looked new. The last few times I’d been here there was really no terminal area to speak of, and the hangars had given me the impression of being dark and unwelcoming. There was no obvious FBO or other services. 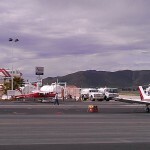 Today there was a renovated terminal building with a flight school and FBO, a clean cheap fuel pit, and a big tanker base. After I got tied down I asked a passerby – a passerby! – if there was a cafe, and I got directions and a microreview. I hadn’t ever seen people walking around HMT before, but the new terminal building had instructors and students coming and going as well as other locals. A Civil Air Patrol flight was just going out, and a fellow was waiting for friends to return. The cafe itself was a short walk past more welcoming and renovated hangars with a bunch of interesting planes tied down in various states of repair. None looked like hulks, but some were clearly being worked on. The cafe itself was hopping. There were a couple tables outside that looked inviting, but I sat inside at the counter to soak up the sound of a busy airport restaurant. The food was very good – excellent for the price – and the folks running the place were great. Despite the fact that the place was probably about as full as they can support, they made sure I was given the full hospitality of the place. I was a lone stranger, and it says a lot that they took such good care of me when they were so busy. I had an “Irish melt” sandwich and they had plaques claiming they’d won pie contests. Clearly a place with their priorities together. 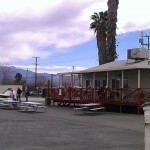 Hemet-Ryan looks like a lively small airport. Stop by and buy some gas and have a meal if you’re coming through the area. I’m already planning to drag my buddies down there. 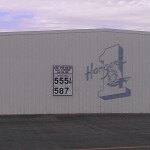 Posted in Aviation, blogbook | Comments Off on Hemet: a small airport gets better! You are currently browsing the Walking on the Moon weblog archives for March, 2013.